Give your leather interior a gentle cleaning with genuine horse hair! Now you can get the benefits of horse hair on the inside of your vehicle with the Natural Horse Hair Interior Upholstery Brush. There is simply no better way to clean fine leather upholstery. The densely packed horse hairs gently massage the leather to release soil and grime, without scratching the leather. Use a pH-balanced leather cleaner with the brush to remove body oils and stains, and to return the leather to its original beauty. When cleaning leather, we recommend using Pinnacle Leather & Vinyl Cleaner with the Natural Horse Hair Interior Upholstery Brush. The natural horse hair bristles will work the cleaner into the leather’s pores, releasing dirt and foreign oils. Follow with Pinnacle Leather Conditioner to condition and protect the leather. Trust your vehicle’s interior to the finest detailing brush nature has to offer! The Natural Horse Hair Interior Upholstery Brush gently cleans leather, fabric, plastics, and more to leave interior surfaces spotless. Worked well with a very good results. Bristles just stiff enough to do a thorough job of cleaning. Conssome bristles fell out of the brush but not enough for real concern. Definitely works great on delicate surfaces but it does tend to shed. I would still recommend it though. 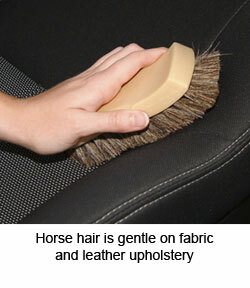 The Natural Horse Hair Upholstery Brush is a great brush for leather cleaning. In fact I was a little skeptical on purchasing this brush but i thought I'd give it a try and it works great. The bristles are soft and ideal for leather. It didn't scratch my leather seats and the handling was great as well. I just wish it was a little smaller as the size of the Swissvax Leather Brush but any how it worked great. Works well, good value. I use this mainly to clean coated leather or vinyl. Works great, safe, and durable. Bought this brush to scrub the leather in my vehicle and it offers good gentle cleaning with leather cleaner.